Make your bathroom feel like a 5-star hotel en suite by adding stunning custom embroidery to your items. 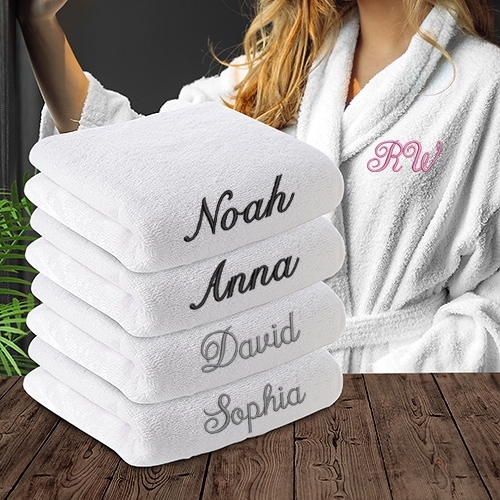 Embroid your name on a set of towels, for that special exclusive feel. Not sure of the perfect gift for your partner? Embroid their name on a stunning luxurious bathrobe and make them feel like a million dollars. 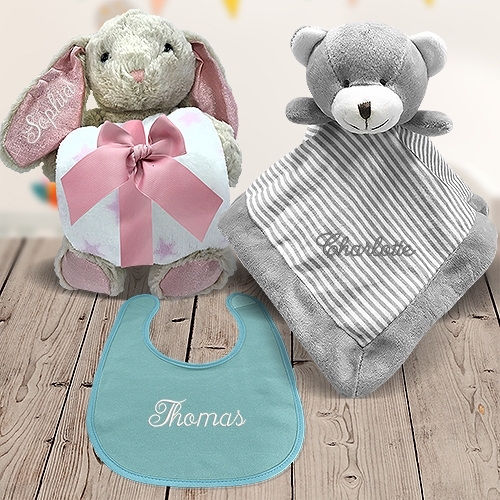 We even offer the perfect gift idea for newborn celebrations – embroid the baby’s name on a warm soft blanket. But it does not stop at baby blankets, we offer an entire range of baby products just begging for your personalised message! Embroid a name on a baby bib, and why not also on a matching hat and towel? In fact, you can completely customise an entire baby set from blankets to toys to even school bags for the toddlers – what a fantastic gift basket idea! With so many embroidery options to choose from, your gift will be one that is cherished and remembered. Our highly specialised printing machines ensure that all our designs are protected from fading, so colours will remain fun and vibrant throughout daily use. Once the designs have been submitted, you can receive them in one of two ways: Absolutely FREE – Come pick it up from the store, we’ll email you when it’s ready! Mail Delivery – we offer both standard and express delivery options Have the perfect custom design in mind? Start designing today!